The "V" Siphon Feed offers the ultimate in versatility and control for detail, tinting and shading. Comes with interchangeable metal color cup 1/8 oz. (3.5cc) for small volumes of paint. Two airbrushes in one. Comes set up as a V#1 and has V#2 needle, tip and aircap in the case. Recommended Air Pressure .5 CFM @ 20 to 45 lbs depending on fluid being sprayed. Recommended for detailing, shading, and tinting. Ideal for china painting and photo retouching. 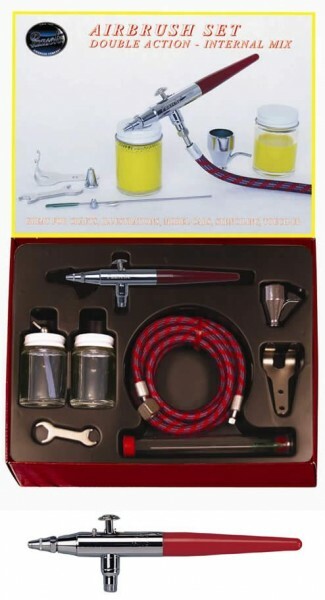 •Instruction manual - "22 Airbrush Lessons"
This product was added to our catalog on 16/05/2011.